Easy success, right from the very first batch. All the resources you need, right here. Say "goodbye" to inferior methods and wasted food. Say "hello" to a happy tummy. ​Each Probiotic Jar is precisely manufactured to exacting specifications and hand polished to ensure the long life of the grommet. When oxygen is allowed to enter the fermenting vessel, then high enough levels of anti-microbial acetic acid is produced which stalls the ferment prematurely. This results in an incomplete fermentation not allowing for the fullest resolution of histamines and incomplete carbohydrate metabolism. 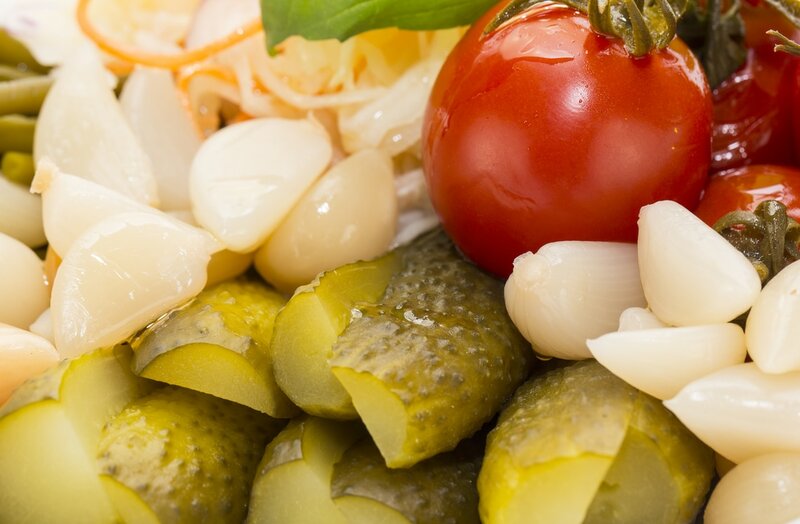 Some histamine sensitive people cannot eat these incomplete ferments without unpleasant symptoms. Preventing oxygen from entering the vessel results in very low levels of acetic acids, and high levels of lactic acid, which is a life-supporting acid that allows the ferment to continue microbial processes all the way through Stage 4, for complete fermentation. You can count on The Probiotic Jar to supply the correct information to move you forward in your fermenting journey. Countless years of research, study, and experience are behind the ancient techniques we recommend. Jump light years ahead by exploring the exact methods used by our ancestors throughout history, combined with cutting-edge technology, for perfect results every time. With The Probiotic Jar there is no need to seal vessels with beeswax or beef tallow to keep out the oxygen as our ancestors before us did, before modern technology allowed us to create the precision equipment we make for you today. A perfect seal allows for preservation and storage of many kinds of finished ferments from season to season and beyond. 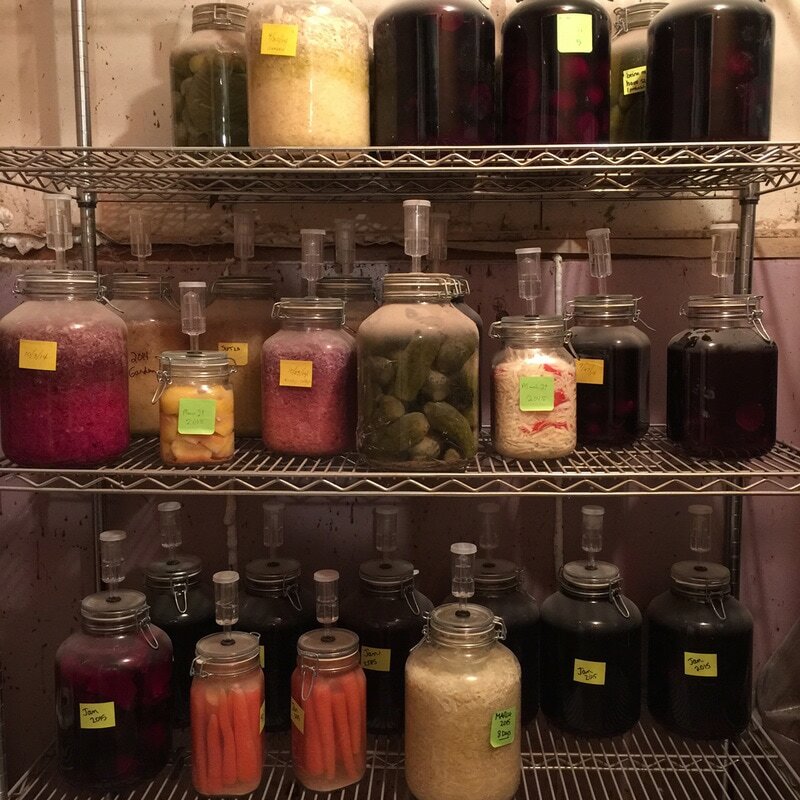 Even root cellar temperatures (55˚F or 13˚C) will preserve the texture and crunch of optimally fermented foods. This is so much healthier than canning, which destroys the enzymes, almost all vitamins, leaving only the sugars and fiber preserved. In a catastrophe, nutrition is going to be crucial. 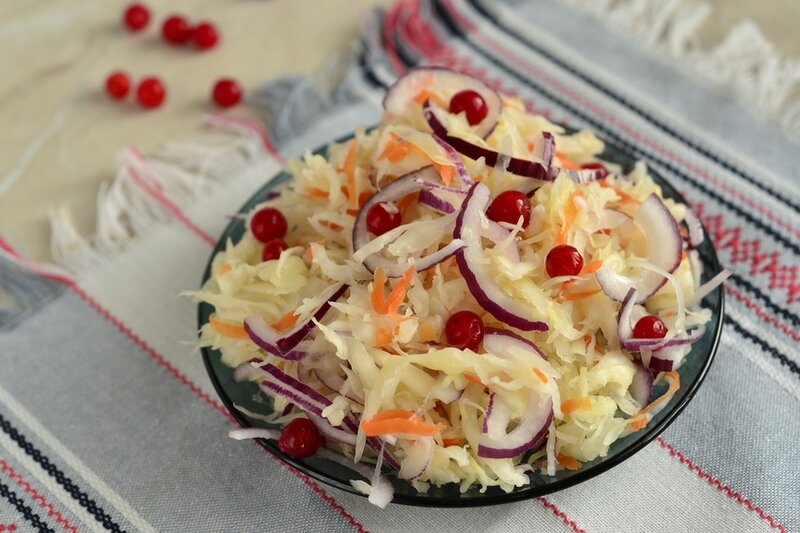 Just a few of the foods that fare very well at 55˚F for a year or longer with airlock maintenance are sauerkraut, dill pickles, kohlrabi, beet kvass, green beans, lemons, peppers, and garlic. "All disease begins in the gut..." Many issues including all types of auto-immune conditions, digestive disorders, skin disorders, mental health disorders, malabsorption issues, and other major health issues can be improved, or entirely alleviated, through the regular consumption of anaerobically fermented foods. 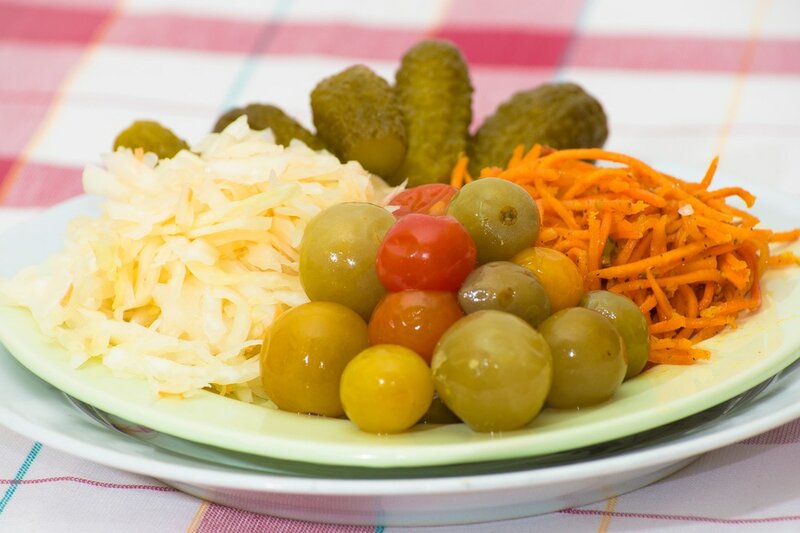 Most health challenged people who have given up on eating fermented foods have found that foods fermented optimally in The Probiotic Jar do not cause the unwelcome symptoms they previously experienced when eating sub-optimally fermented foods. Every single heaping bite of sauerkraut has more viable probiotic bacteria (trillions) in a wider range of strains than an entire month's supply of a refrigerated pharmaceutical grade probiotic pill (the best you can get). Eating just a bite every meal has the power to truly impact your health in a meaningful way that you simply cannot attain with other methods. The Probiotic Jar does not allow mold to flourish. Period. Mold will not ever develop while fermenting fresh, organic vegetables. Not ever. 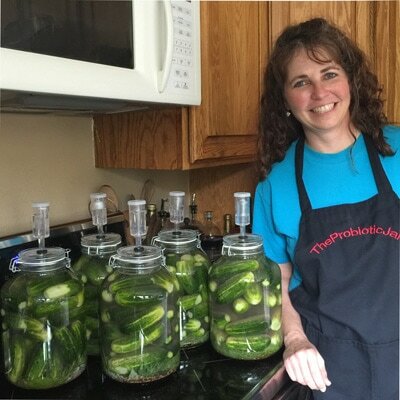 ​People who are mold sensitive report doing very well eating their Probiotic Jar ferments. 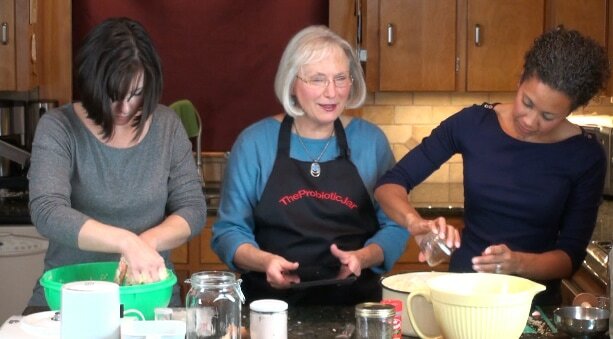 With The Probiotic Jar you will never have to skim the scum off of your ferments again. Nor shake them every few hours to submerge and slow down the forming scum. Moldy scum just won't happen when fermenting in The Probiotic Jar when using fresh, clean, organic vegetables. This is because oxygen is eliminated and suffocates the few mold spores which are naturally present. 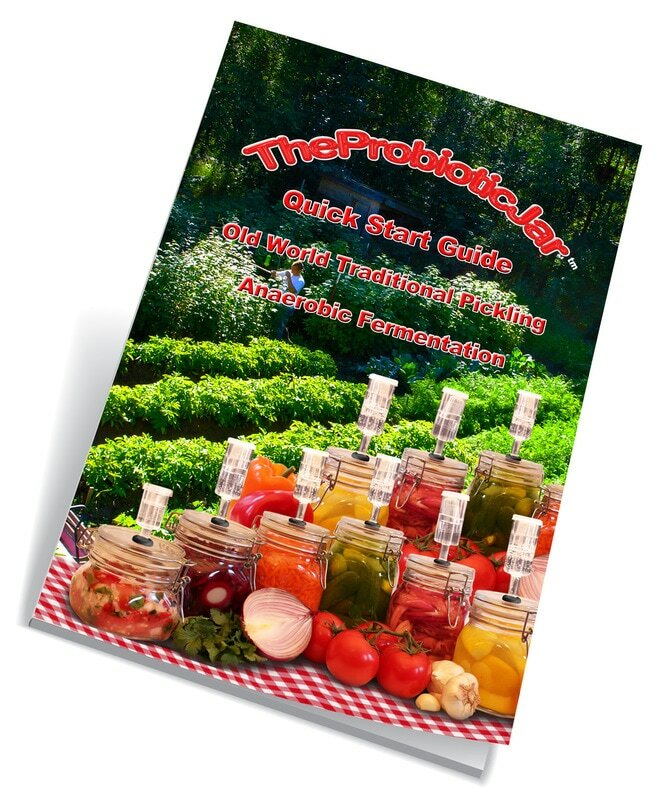 The environment in The Probiotic Jar is so ideal that you can rely on spectacular results with your precious organic vegetables every time: without whey, vinegar, starter cultures, or excessive levels of salt. In fact, whey added to vegetable cultures actually inhibits the optimal process. The dairy strains in whey compete with the ideal vegetable strains, resulting in a less-than-optimal outcome. Moreover, adding whey to a ferment artificially lowers the pH, entirely skipping the vital first stage of the fermenting process. This is when specific first-stage bacteria, which function at the higher acidic pH range, deal with pathogenic bacteria and toxins. These bacteria also release nutrients in the first stage. 1. Mold suffocates. Mold cannot grow in the absence of oxygen. 2. The ferment is able to finish completely, because the lactic acid bacteria produce lactic acid when oxygen is not available. When oxygen is available, the bacteria produce acetic acid. This seems to stall the ferment somewhere in Stage 3 when the antimicrobial acetic acid is too high for the lactic acid bacteria to continue to reproduce and metabolize the carbohydrates. This matters to people with histamine sensitivity. Most of the bacteria that resolve the histamine compounds produced early in Stage 1 and Stage 2 are only active in Stage 4 within a strictly anaerobic environment. The other concern is mold sensitivity. Some people can not eat ferments with mold thriving just below the threshold of visible spoilage. It is concerning that "regularly shaking" the ferments to prevent mold from blooming may not be adequate. Lactic acid is the highest standard for both production of probiotics as well as preservation. The properties of acetic acid limit the activity of lactic acid bacteria (fermenting microorganisms). Even though the pH of lactic acid is lower than that of acetic acid, the bacteria are not inhibited by the unique properties of lactic acid. Many people erroneously believe that if they can keep the veggies under the brine, then anaerobic fermentation is taking place. If that were the case, fish would not be able to utilize oxygen from the water in the ocean. The fact is that as long as oxygen is available at the surface of the ferment, oxygen is dissolving into the brine. The microbes in the ferment take a different metabolic pathway, which changes the types of acids produced in the ferment. This different acid type prevents the ferment from ever reaching Stage 4 for the full benefit of anaerobic fermenting. Fermenting with oxygen available at the surface does deliver the flavors of fermented food, but the optimal health benefits from the full microbial spectrum are not reached since all four stages of fermenting will not be completed. The lactic acid bacteria strains from Stage 4 will not develop. With 70-80% of our immune system residing in the digestive system, our gut health has a huge impact on our overall health. Optimal techniques bring optimized health results. The very first thing Probiotic Jar users notice is the vast improvement in flavor. The ferments from a controlled (anaerobic) environment versus those from an uncontrolled (aerobic) or limited contol environment (systems that are supposed to seal, but do not) are distinctly different. ​Keeping out the oxygen to prevent mold and aerobic yeasts from flourishing is the key to enhancing the flavors of the ferments. Anaerobic ferments have a true flavor advantage: vegetable ferments have clean, sharp flavors; cultured milk kefir takes on a bright, lemony flavor; and water kefir tastes less yeasty. ​1. Never attempt brine-based fermenting of cooked or canned foods. The risk of food poisoning exists under this condition. Cooked foods can be fermented, but special rules apply, and specific cultures must be employed for safety. 2. Always use at least 2% brine for safety - salt and minerals are key components of pathogen management, and some pathogens will flourish if sufficient salt is not present. The First Stage lactic acid bacteria thrive in a 2% brine, and the salt and minerals are key to the start of the cascade of microbial events that will follow in a safe ferment. ​Do not use recipes that call for cooked ingredients, or reduce the salt levels below 2%.